Krebs’ speech came in response to a series of crackdowns, dubbed the “War on Fun,” that had made it harder to access alcohol on campus. The athletic department had forbidden students from bringing alcohol to football games at Baker Field, effectively ending tailgating. Postcrypt, the student concert venue in St. Paul’s Chapel, discontinued its long-running beer sales after being told that it must hire an alcohol proctor at prohibitive cost. The tradition 40s on 40, which used to entail students day-drinking on Low Steps 40 days before graduation, briefly became an administration-run barbecue until it was canceled after running up infrastructure costs of $20,000. (It was later reborn in its current form, which takes place in the middle of the night.) Drink limits mellowed the ragers held in the increasingly mislabeled Lerner Party Space. 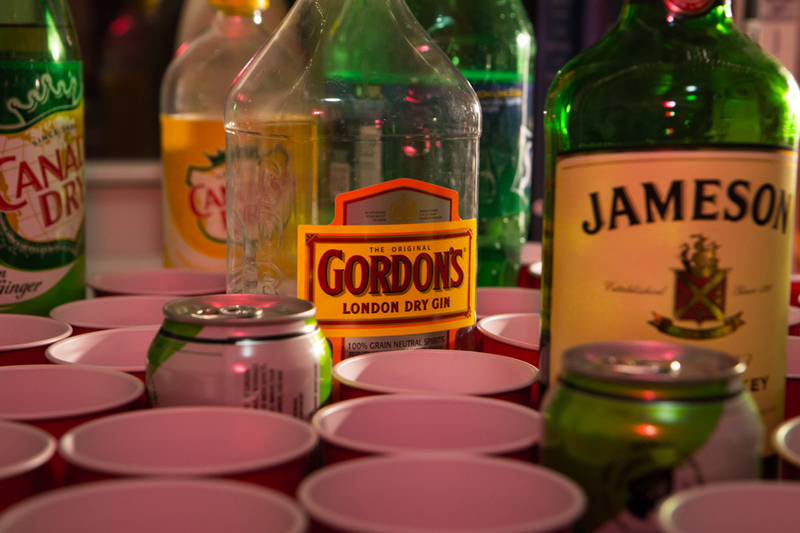 Resident advisers began enforcing previously ignored rules about drinking in suite common areas and breaking up previously neglected parties in East Campus and Ruggles. 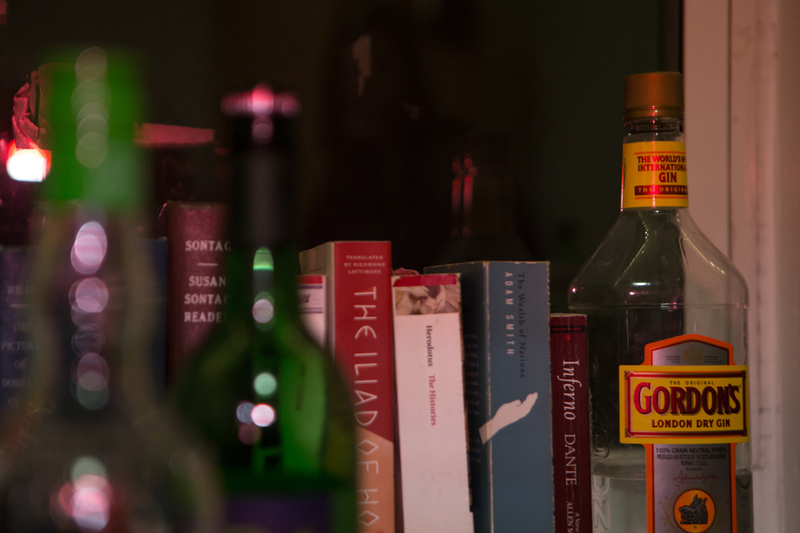 The battle over access to alcohol captivated the campus for years. Malina Welman, who graduated from Barnard in 2015, wrote an urban studies thesis subtitled “The Fight to Establish a Sustainable Social Culture for Columbia University’s Undergraduates.” In 2014, an op-ed reflected on living in the “rubble” of the War. 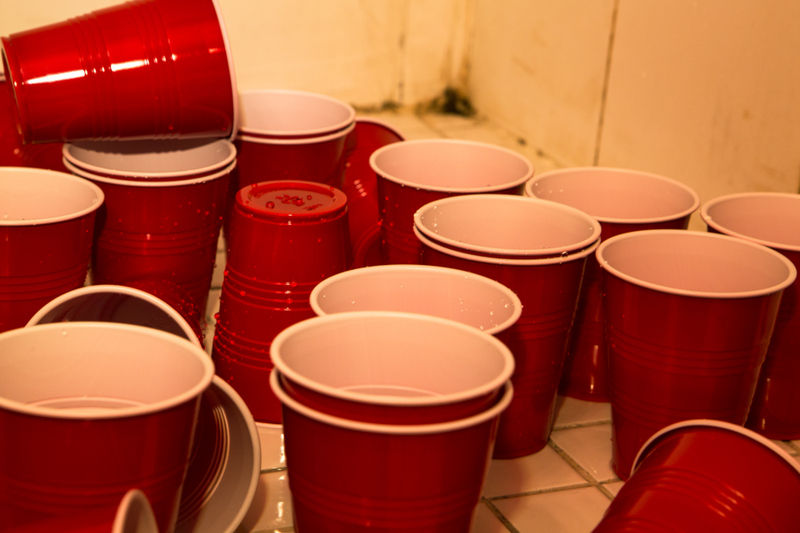 When the smoke cleared, students licked their wounds at off-campus bars or swayed to Top 40 hits at fraternities, which had benefited from stricter dorm enforcement. During the peak of the War, between 2006 and 2009, Columbia saw a dramatic rise in a statistic that Public Safety calls “Discipline[s] for Alcohol.” At the time, this statistic counted the number of students who were referred to the Dean’s Discipline process, housed in Student Conduct and Community Standards, for a violation of a liquor law, such as underage drinking. After the peak in 2009, the number of disciplines for alcohol declined for a few years. But since 2015 the numbers have shot back up, despite no indication of a sudden increase in binge drinking. In a statement to The Eye, University Life suggested that some of the spike between 2015 and 2016 may have resulted from a change to the federal reporting guidelines in a Department of Education handbook on campus safety. In 2016, Columbia began to count students who were referred to a substance counseling service called BASICS, or who received a Residential Life policy reminder, in addition to those referred to Dean’s Discipline. Columbia Health declined to provide data on the yearly numbers of participants in BASICS. Students can go through Dean’s Discipline for breaking rules that are specific to Columbia, such as those prohibiting keg stands, beer pong, or hazing, or for violations of the law, such as underage drinking or furnishing alcohol to minors, that are also against Columbia’s rules. According to the DoE handbook, only the second group is counted in the statistic. A student found responsible for a policy violation by the Dean’s Discipline process should expect, at minimum, to be put on Conditional Disciplinary Probation, in which they maintain ‘good disciplinary standing’ as long as they stay squeaky clean for a year. ‘Good disciplinary standing’ is important; you need it to live in a Special Interest Community, like InterCultural House, or to be a leader in certain clubs, like Columbia Outdoor Orientation Program. More serious punishments include loss of housing, suspension, or expulsion. Andrew Miltenberg, a lawyer who won a settlement against Columbia after the school allowed Emma Sulkowicz to complete her “Carry That Weight” performance art piece, says that by increasing its policing role on alcohol, the University also takes on liability: “The moment you miss one event or one situation, you get sued for negligence or improper oversight,” he explains. 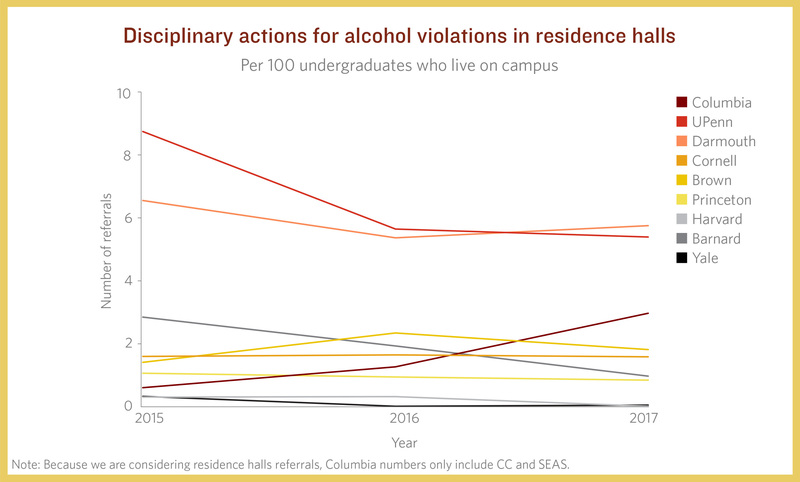 When asked whether the number of students receiving sanctions beyond a disciplinary warning for alcohol violations has also increased, Student Conduct and Community Standards declined to answer. The significant rise in alcohol disciplines at Columbia is unique among Ivy League schools and coincides with changing Residential Life policies. But disciplinary outcomes are not standardized, and some student leaders involved in drug and alcohol policy admit that they are sometimes ill-equipped to answer questions about how alcohol is enforced on the ground. In 2016, Yale sent a grand total of zero students to a disciplinary office for violations involving alcohol in residence halls. In 2017, Harvard did the same. Among the Ivies, Columbia does not have the most residence hall disciplines for alcohol—that honor goes to the University of Pennsylvania, with over 1,000 in a three-year period—or even the most disciplines per capita—here’s looking at you, Dartmouth. But even though the change in counting came at the federal level and applied to all Ivies, Columbia was the only Ivy to see a substantial increase in statistics for dorm alcohol enforcement from 2015 to 2017. In an analysis of alcohol disciplines per 100 students who live on campus, Columbia went from being one of the most lax Ivies in 2015 to being one of the strictest in 2017. 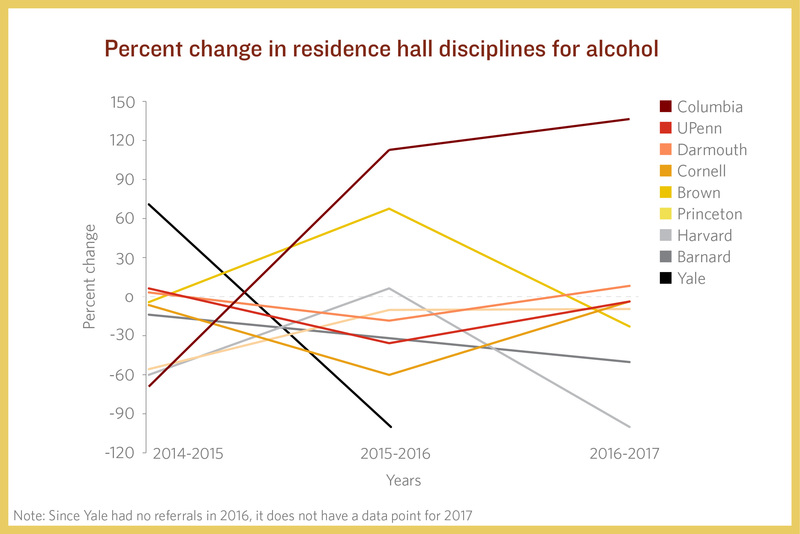 This sharp rise in disciplines for alcohol between 2016 and 2017 begs two questions: Are more students drinking in violation of the rules? Or have the rules gotten stricter? Some of the students in leadership or policy positions related to alcohol or drugs who I interviewed suggested that partying had declined and that frat row had been noticeably quieter. But students are notoriously bad at estimating the drinking habits of their peers. A nationwide survey assessing health trends on college campuses found that only 13 percent of undergraduates thought drinking on two or fewer days per month was “typical,” even though over half of the 47,000 respondents reported that in the last 30 days, they themselves had consumed alcohol that infrequently. At Columbia, one potential proxy for alcohol use (or overuse) is the number of times emergency medical technicians respond to alcohol-related incidents. Nikola Danev is a junior in Columbia College and the director of Columbia University Emergency Medical Services, which changed its name from Columbia Area Volunteer Ambulance, more popularly known as CAVA, over a decade ago, though the new name has never caught on. He tells me, ruefully, that his organization prefers to be called CU-EMS. Unfortunately, the previous acronym is so entwined with alcohol abuse that in campus slang, “getting CAVAed” has come to mean being transported for alcohol intoxication. When I ask for the specific number of dispatches related to alcohol, Danev demurs. He does, however, provide me with statistics for the total number of CU-EMS responses. He also confirms that the percentage of those responses involving alcohol—surprisingly, only about 18 percent last year—have been consistent in recent years. These data points suggest that an increase in binge drinking does not seem to be driving the increase in alcohol discipline. So what is? 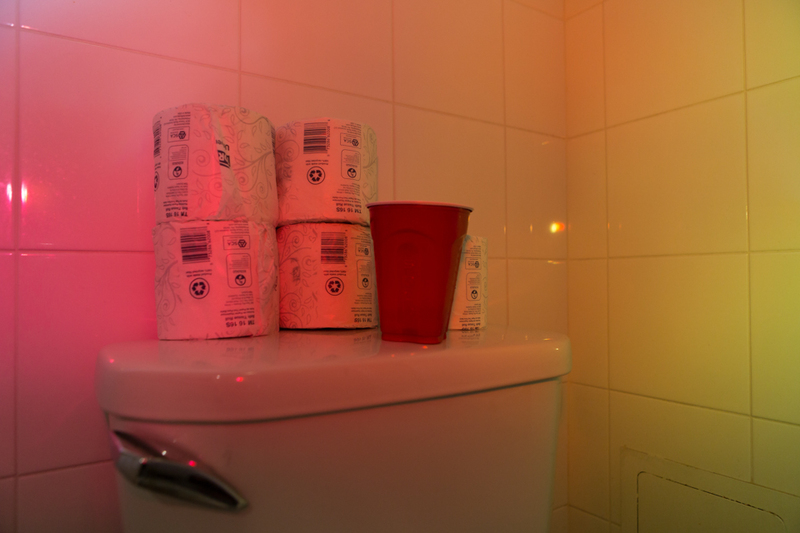 Josef Starc, who graduated from Columbia College in 2018 and served as an RA in Carman during his sophomore and junior years, calls this the Residential Life “party line.” Starc told his residents that he didn’t really care if they drank in their rooms, but if they were drinking in the hallway or out in the open, he would have to write them up. 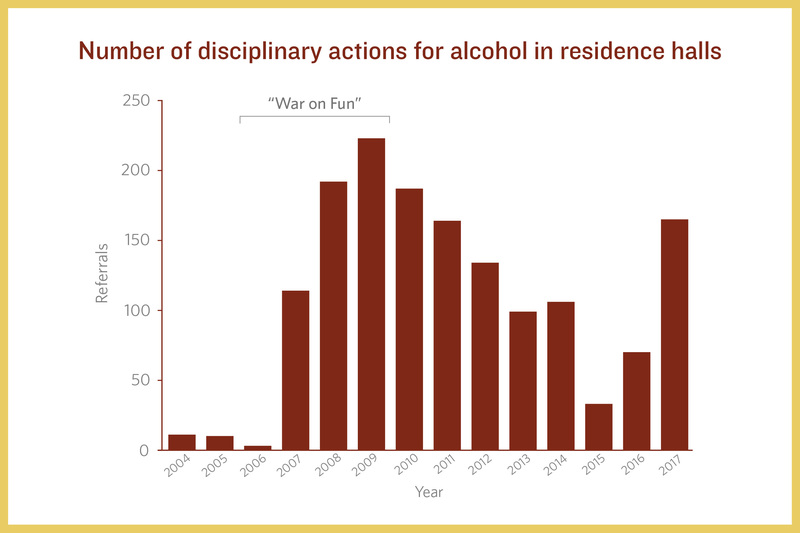 Dorms are the epicenter of alcohol discipline at Columbia; all but four of the 272 disciplines for alcohol between 2015 and 2017 took place in residence halls. Scott Bernstein, a lawyer who specializes in campus discipline, tells me that a private university like Columbia has no obligation to enforce state liquor laws. Still, he says that Columbia, like any private institution, cannot itself break the law by serving minors. In other words, Columbia Dining couldn’t jazz up Surf and Turf by serving alcohol to beardless first-years, but RAs don’t have any legal obligation to break up Carman bangers. Because of this, schools can have dramatically different policies. Students in first-year dorms at Stanford are supposed to keep the door open if they choose to drink so that RAs can check in. Students at Rice often drink beer or wine in their dorm without disciplinary repercussion, but may face severe repercussions for drinking hard alcohol. If an RA at Yale sees a first-year drinking, the student would have to pour out the alcohol, but no one would submit a written report to a higher authority. The expectation at Columbia, that RAs are supposed to write up any policy violations they can see, can drive drinking into darkness, where common sense, like democracy, dies. James Ritchie, Columbia College president of the Class of 2020, says Columbia has a “blackout culture,” and thinks that when students can only drink behind closed doors, they’re more likely to make mistakes. Anyone unlucky enough to have spent an extended period of time in Mel’s on a weekend night can confirm that students make mistakes. Many drunk students, cared for by friends, drink a glass of water, put a trash can by the bed, and assume that they will wake up the next morning with nothing more than a headache. But every year, across the country, college students die from alcohol poisoning or from choking on their own vomit. Deborah Hasin is a professor of epidemiology at Columbia University Medical Center who directs a substance abuse epidemiology training program at the Mailman School of Public Health. I ask her over a phone about a technique I’ve heard about, in which a very drunk person is strapped into a backpack and pushed onto their side, to prevent them from choking on their vomit. Hasin had not heard of the technique, but is audibly horrified. “People should not be drinking so much that this is something people feel they need to do or think about doing,” she tells me. Residence hall disciplines for drugs have also increased steadily, from 109 incidents in 2015 to 178 in 2017. Students disciplined for drugs can expect a similar process. In January, a sophomore in Columbia College who was granted anonymity began to feel sick after taking a hit of marijuana. “I was very scared because it was with people that I didn’t know, and I was like ‘what was in this weed?’” she says. She thought she was going to pass out, so she called 911, then reconsidered and called the Columbia emergency number. Public Safety answered and dispatched a CU-EMS ambulance. Both CU-EMS and an ambulance dispatched by 911 showed up to her dorm. The medics explained that an ambulance ride with CU-EMS was free—a better way to put it might be ‘already included in your tuition’—while a ride with the city ambulance would be expensive. Students who call for a Columbia ambulance may still pay a hefty ambulance fee if both of the CU-EMS ambulances are in use. And anyone going to the hospital can also expect a bill from St. Luke’s. The sophomore remembers riding with CU-EMS to St. Luke’s, where she went to a room in the back and slept. (Starc, the Carman RA, calls this room the “drunk tank.”) She woke up a few hours later, and walked back to her dorm. RAs submit their write-ups to a system called Maxient where the incident reports are reviewed by a residence hall director. Serious incidents, like those involving suicidal ideation or sexual violence, are escalated to other University offices. 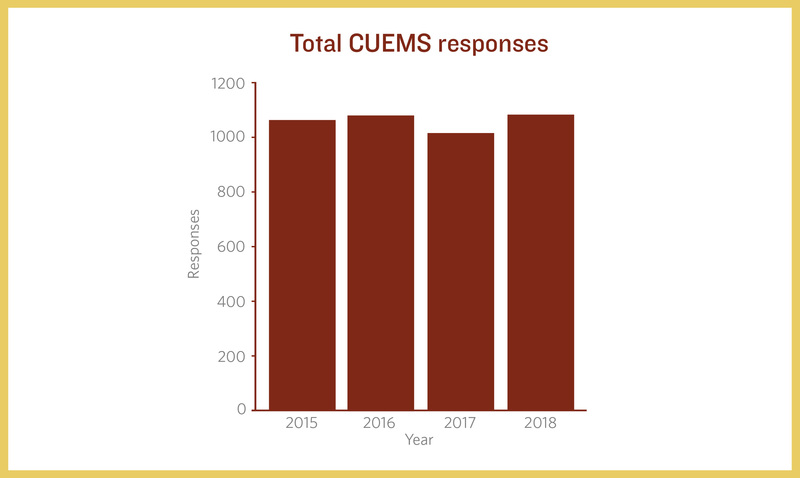 While CU-EMS bills itself as confidential, Public Safety, which handles its dispatch and often responds along with it, does not face the same medical privacy constraints. When a student is transported by CU-EMS, the residence hall director who is on call is notified by Public Safety. In an email, a University spokesperson clarified that Public Safety would typically not notify additional parties if an intoxicated student was given care on scene and not transported to a hospital. Peter Trevino, a sophomore in the School of General Studies and the president of the Columbia Recovery Coalition, a support group for people in recovery for issues including substance abuse, explains that, based on his experience, most people who get in trouble for alcohol are not alcoholics. “Lies! All lies!” he shouts. Trevino, who struggled with alcohol addiction in his teens and has been sober for over 30 years, knows better than most that this isn’t true. But he thinks that harm reduction proceedings like BASICS are often not very helpful when dealing with addiction issues. But addiction is not the only priority for alcohol education programs. Hasin clarifies that there are various levels of problem drinking and that even one instance of binge drinking is associated with a substantial increase in risk for continued binge drinking. Kevin Graves, who graduated in 2018 from the School of General Studies and co-founded the Columbia Recovery Coalition, emphasizes that underage drinking is not the same thing as “problem drinking.” He also wonders whether students will respond truthfully to a questionnaire about their drinking habits, given that they might fear repercussions. The actual repercussions for breaking an alcohol rule are not always immediately clear to first-years and students undergoing the disciplinary process. Starc tells me that during training in 2015 and 2016, RAs were instructed to tell students who got written up that the process was out of the RAs’ hands, and to not to say with certainty if someone would get in trouble. Still, the ubiquity of student drinking—it’s as sure as death or taxes—combined with a fundamentally sane Residential Life department means that nobody really expects under-21 Columbians to stay dry. The gap between policy and reality can lead to some dissonance. Your computer science professor would not pass out the syllabus and say ‘Now, technically, you’re not allowed to cheat, but if you do, I want you to do it safely,’ but an RC@C leader might say an analogous thing about drinking. Bernstein suggests a hypothetical situation where the University would be liable for a student who falls sick. “I could imagine if a student drinks way too much at a particular dorm and they get alcohol poisoning, and the employees of the University knew about it and saw it and allowed it to happen, that school could be in a trouble in a civil lawsuit for negligence,” Bernstein says. The parents of students who died in hazing incidents involving alcohol have won settlements from fraternities, and in some cases, the universities themselves. In recent years, Residential Life has instituted a number of changes that may have contributed to the uptick in alcohol disciplines. In the fall of 2014, Residential Life began to transition from graduate hall directors (part-time graduate students who oversaw a dorm) to full-time, nonstudent hall directors, called residence hall directors. By the fall of 2016, Residential Life had added RAs to all fraternity and sorority brownstones. Another switch came during the 2016 fall RA training, when Residential Life began to emphasize that RAs should document every incident, no matter how small. “In 2015, they always said, like, document everything, but by 2016 training that was really pushed,” says Liz Einstein, who graduated from Columbia College in 2018 and worked as an RA for three years. Before, she explains, it was more up to the judgement of the RA. “There was a recognition that a lot of stuff was kind of flying under the radar a little bit and not really being accounted for,” Starc says. The exact effect of these changes on the number of alcohol disciplines remains uncertain. At Columbia, a student searching for clear answers about what actual alcohol enforcement is like might encounter waffling from their RA, their RC@C leader, and their student navigator. They also might be confused—or incredulous—about some messaging about substance use on campus. Twelve years ago, students weren’t so sure. As institutional memory of the lax old days fades, student uproar has died down. But the recent rise has brought alcohol discipline to levels not seen since the War. Will student outrage awaken, or even explode, into a Second War on Fun? Or are we, finally, at peace with how we party? Correction: An earlier version of this article said that Columbia Recovery Coalition was a substance abuse support group. The Coalition supports recovery of all kinds, including food issues and family trauma. Enjoy leafing through our eighth issue!